Sithabile Mngadi joined the HE2RO team in November 2017 as a Contract Researcher. 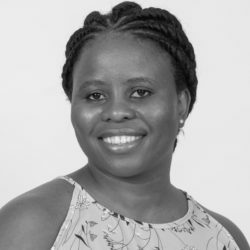 She holds a Master’s degree in Population Studies, and has over five years’ experience in Research, Monitoring and Evaluation and Quality Improvement work, focusing particularly on HIV/AIDS in South Africa. Sithabile has worked with International and local non-profit organizations. Her other work areas and professional interests also include non-communicable diseases, Sexual reproductive health and Adolescent work in an HIV/AIDS context.